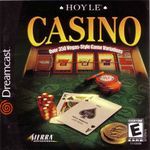 Hoyle Casino is a virtual casino game game published by Encore, Inc. It was previously published by Sierra Entertainment for a variety of different platforms, including Microsoft Windows, Sega Dreamcast, and Game Boy Color. Set in a virtual Las Vegas casino, players create profiles and are given a set amount of virtual money. A player can then visit any part of the virtual casino and wager their virtual money as they could in a real casino. The game offers instant access to the rules for each game, as well as real time tips and strategies as the player plays a game. Source: Wikipedia, Hoyle Casino , available under the CC-BY-SA License.